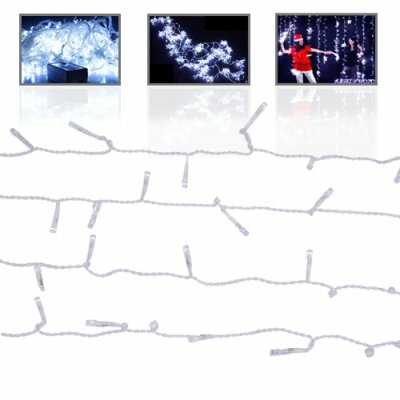 Successfully Added LED Twinkle Lights - 1000 Light Snowfall Curtain to your Shopping Cart. Make the night come alive with this massive 1,024 LED Light Curtain containing 32 independent strings of lights. This ultimate sized LED Light Curtain contains enough cord and lights to cover a wall, window, landmark tree or whatever you want to decorate this year. Have you ever wanted to decorate a large wall, lobby, window display or family room but found that to do it well you ended up using so many different strings and power connections that what you thought would be a simple job turned into a nightmare? Well, with our CVHZ-G155 you can take up any creative decorative lighting job with ease. Coming with a thoughtful design of 32 belt lines of 3 meters each and containing 32 LED's per line, you can design with light in ways you never thought possible before. With one primary rope that holds the 32 evenly spaced belt lines, installing these hanging LED light strings onto walls, ceilings, or other surfaces has never been easier! And with one simple power connection and in-line controller, getting the lights powered and controlled to give you the creative effects you want is now so easy even Mr Bean couldn't screw it up! Whether you call these LED Light Strings "Twinkle Lights", "Fairy Lights", "LED Snowflakes", or "Light Cord", there is no doubt that this is the coolest decorative lighting idea in ages. Available in our warehouse right now for single piece or bulk stock purchases, place your order today and we will express ship it out tomorrow! Easy to install - one power cord for the whole setup! Full sized decorative white LED Light String Curtain with in-line controller. This size is impossible to find in big box stores! Note that when using this outdoors, while the string light itself is weatherproof, the power supply IS NOT. The power adapter and controller MUST BE KEPT DRY AT ALL TIMES. Can I use this on my pine tree? Yes. It can be safely used on any any tree. This product is 3 meters long with 32 three meter long belt line extensions. Can I use this in my bedroom? Certainly! If you want to use this as a mood light in your bedroom, game room or covered balcony, go ahead and enjoy it! It is simple to install, U-shaped construction staples/clips can be used as well as CAT5 style cable mounting clips. Caulk or clear silicone gel is also popular for installing LED string lights when you want the installation to be permanent.